I drove down the road toward Reggio Calabria. It had only two lanes and was pitch dark. As I approached the exit for Seminara, I was astonished to see the giant olive trees; they seemed to be thousands of years old. I thought that here is the earth at its best, so rich in her gifts to us! The word Seminara comes from semens (Latin for seed.) 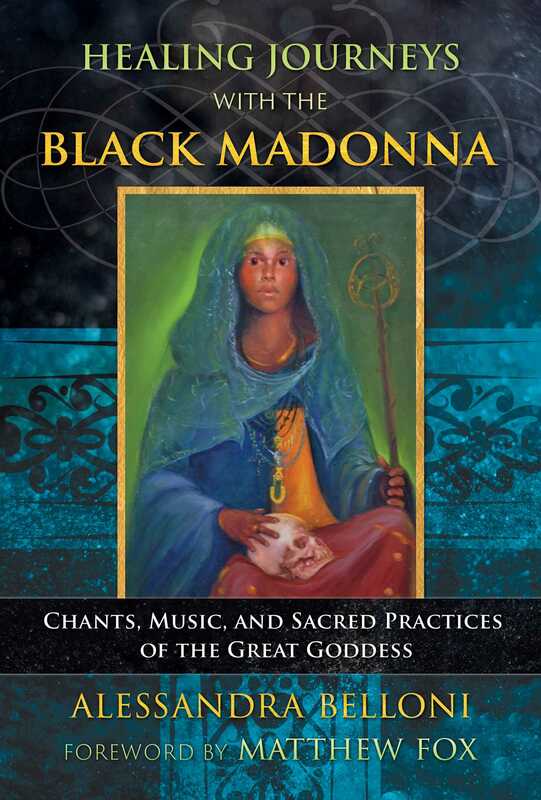 From the trees and the name of the town it was very clear to me how this Black Madonna must be connected to the earth. As I was getting closer to the church, the street decorations and vendors of local craft were extremely festive, as was the local food being cooked in the street. The air was filled with strong smells of goat meat, sausages, and sweet almond pastries. Then suddenly, I heard very powerful loud drumming. Snare drums! As the sound got closer I started running up the hill. So taken by the music, I felt I was in Africa and not in Italy! At the top of the hill was a group of twenty snare drummers, marching and playing the bass drum and cymbals, at an obsessive, loud, fast 6/8 rhythm, which was a tarantella, but felt very African and tribal. The leader of the team was a tiny man with a thick moustache, playing super-fast. He had a beautiful, proud face as he directed the group of drummers. I also saw the most beautiful giant puppets, called I GIGANTI, dancing toward us in a sensuous tarantella. One of the puppets was a stunning black African king, the mythological Grifone. Dressed with green, red, and gold, he wore a crown and was courting in a dance the beautiful white Italian Queen, the mythical Mata, smiling in a gold cape and a red and blue dress. In this dancing courtship, Mata and Grifone fall in love, and their union represents the coming together of the African culture with the Southern Italian. Spurred on by the rhythmic beat of drums, the dance is then sealed with an embrace and a kiss symbolizing peace among our cultures and races. The drums got louder, and I saw a man dressed in white and blue dancing with a Palio (large flag) in a very unusual way. The dark-skinned man looked very proud as he held between his legs the huge blue Flag with golden stars and performed a sensuous dance with the pole tied to his arm. He danced in a circle and also dropped down on his knees in a circular motion, whirling, as if caressing the earth, to the loud 6/8 rhythm of the tarantella played on the snare drums. I jumped up and decided to follow this wild man and his team. He had a lovely, benevolent smile and nodded to me to follow him through the streets toward the procession of La Madonna Nera. Feeling the fast rhythm inside my bones and pulsating in my heart I began dancing in circular motion, following the steps of the flag bearer and I Giganti, through the winding streets, up and down, not thinking at all that I could break an ankle or fall on the cobblestones. I was feeling deliriously happy and light as I spun around in circles. As I danced to this African-accented rhythm, I arrived in front of the beautiful Basilica, where a huge crowd was screaming, EVIVA MARIA, crying and sobbing, as the stunning Statue of the Black Madonna dei Poveri was coming out of the Church! The Madonna of the Poor! There she was, unbelievably powerful and mysterious. Feeling complete ecstasy, I saw Her. Finally a beautiful black statue, which looked very ancient, with a strange enigmatic smile and face that seemed so alive, staring at all of us, with no real eyes, yet, looking alive. Dressed in an ancient looking tunic, She was the color of the earth herself, dark brown and adorned in gold decorations. And astonishingly, She had blond hair! Wearing beautiful silver jewelry, large earrings and necklaces, She looked North African and even Gypsy. Her black son, Jesus, was standing on Her lap, holding a globe in His hands. Carrying Her out of the church was a group of twelve men dressed in white and blue. It was clear that the statue was very heavy, as the Queen of Heaven’s incredible throne is made of solid silver and gold. Two golden angels perch above her on each side, were holding the Canape with elaborate decorations. I stared at Her and wondered why it is that this Black Madonna wears a very simple earth-colored tunic with no other colors on Her, but is surrounded by a heavily decorated and precious throne, Her own altar. She was an unusual, ancient looking, mysterious, and enigmatic statue, almost one meter tall; yet she looked bigger. She seemed to be staring at me from above Her throne, smiling as if she were happy I had finally arrived. . . . This was my feeling, again to be welcomed by Her as Her daughter. – Ami Belli, vice president and international liaison for health rhythms at Remo, Inc.